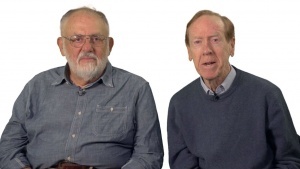 Cleve Moler, founder and chief mathematician at MathWorks, and Gilbert Strang, professor and mathematician at Massachusetts Institute of Technology, provide an overview to their in-depth video series about differential equations and the MATLAB® ODE suite. Differential equations and linear algebra are two crucial subjects in science and engineering. Gilbert Strang's video series develops those subjects both separately and together and supplements Gil Strang's textbook on this subject. Cleve Moler introduces computation for differential equations and explains the MATLAB ODE suite and its mathematical background. Cleve Moler's video series starts with Euler method and builds up to Runge Kutta and includes hands-on MATLAB exercises. CosmoLearning is promoting these materials solely for nonprofit educational purposes, and to recognize contributions made by Massachusetts Institute of Technology (MIT) to online education. We do not host or upload any copyrighted materials, including videos hosted on video websites like YouTube*, unless with explicit permission from the author(s). All intellectual property rights are reserved to MIT and involved parties. CosmoLearning is not endorsed by MIT, and we are not affiliated with them, unless otherwise specified. Any questions, claims or concerns regarding this content should be directed to their creator(s).